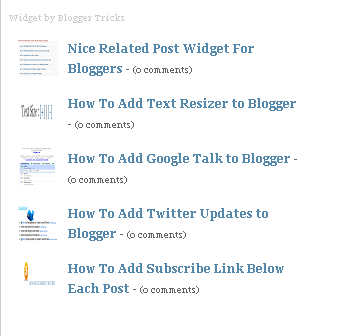 The Author of this nice widget is Bloggertricks.com. This is a great widget for bloggers. To add this nice widget to your blog follow this easy steps. Note : Remember to replace YOUR BLOG ADDRESS with your real blog address. You can change boxwidth,cellspacing,borderColor,thumbwidth & thumbheight,fntsize,acolor,aBold,numposts,.. as your choice.